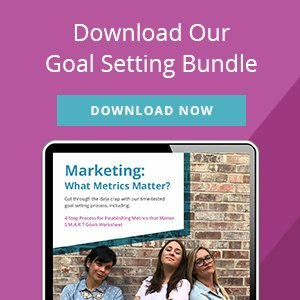 Once you’ve identified the metrics that matter most to your business (download our guide: “Marketing: What Metrics Matter?” for our 4-step process), goal setting is the next step in achieving success. Setting business goals can be a daunting undertaking for some, but it’s much simpler if the right method is followed. Don’t set goals just because you feel as though you should have them—goals are only beneficial when there is value in achieving them. S.M.A.R.T. goal setting is a simple, trackable method that allows people to create clear and achievable business objectives, instead of vague resolutions. It is one of the most effective tools for achieving goals in the corporate world due to its scalability, ease of use, transparency, and proven success. Goals should be written simply and clearly define what you are setting out to do. With whom will it be done? Increase the average number of prospective student leads by deploying a Facebook Lead Generation campaign in order to ultimately enroll more students and increase revenue to the school. Having a measurable goal means that someone can see, feel, hear, or identity in some way when it has been achieved. This may sometimes mean breaking your goal into several measurable elements. By what metric will you know the goal has been reached? What precise amounts can you include? Can you use words like “increase by X %; improve by X amount”? Increase the average number of prospective student inquiries (through phone calls or website form fills) to 325 per month. Review your specific/measurable goal to make sure it seems reasonable with a little bit of stretch. Are you confident this goal is achievable and sets realistic expectations? Do you have enough time to reach your goal? Do the involved parties have the tools and skills they need to accomplish it? What obstacles would prevent me from reaching this goal? The average number of prospective student inquiries is currently 290, so an increase of 35 leads seems achievable. Making sure your goal is relevant assures it is aligned with the broader business goals. Reaching goals is only beneficial when they contribute to the company’s success in some way. Why am I setting this goal now? What is the company’s overall objective? How it this goal aligned with the overall objectives? The school has decreased the cost of tuition, requiring an increase in enrollment to 100 total students. If the “close rate” of prospective students remains constant, then the total number of prospective students must increase to 325 per month in order to ultimately enroll 100 students. Goals should exist in a timeframe that creates a practical sense of urgency appropriate to the importance of achieving it. If the end date is many months down the road, set milestones throughout the period to evaluate progress. Do I need additional milestones to keep this goal on track? Do I have enough time to accomplish it in the given time frame? The deadline is January 30th, giving us 90 days to increase the average number of prospective student inquiries. Review what you have written, and craft a new goal statement based on what the answers to the questions above have revealed. By January 30th, increase the average monthly prospective student leads to 325 per month by deploying a Facebook Lead Generation campaign. What strategies will you deploy in order to achieve this goal? When will you deploy them? How will you keep track of its progress? Who needs to be notified of its progress and how often? Wondering how to put this into action? Download our Marketing Goal Setting Guide, which includes a S.M.A.R.T. Goals Worksheet as well as a 4-step process to setting Metrics that Matter. Need some human support? Contact us today to speak with one of our strategists about how we can support you in setting marketing goals for your business at (504) 208-3900 or fill out the form to the right.